The Marrakech Museum for Photography and Visual Arts (MMPVA) has been awarded the “Best Emerging Culture Destination Africa” Prize, by the Leading Culture Destination Awards 2015. The Marrakech Museum for Photography and Visual Arts has featured the work of Don McCullin, Lewis Morley, Magnum and Moroccan photographers inside its temporary home at the Badii Palace. The El Badi Palace, originally commissioned by Ahmad al-Mansur, is this progressive museums home until new construction is complete by Sir David Chipperfield in 2016. Renowned architect, Sir David Chipperfield is the creating a distinct and contemporary building for the MMP. The Marrakech Museum for Photography (MMP) offers a rich program of exhibitions, education and cultural exchange will making it a first example of this kind of artistic institution on the African continent. David Knaus is the Marrakech Museum for Photography and Visual Arts Managing Director. Inclusive in their programming is educational scholarships, exhibitions that are contemporary and showcase a host of Moroccan and non-Moroccan talent. The MMP’s website offers showcases its events, an online gallery, a Collector’s program along with information that is up-to-date on current exhibitions. 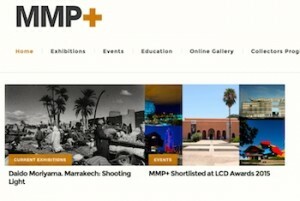 Established in 2012 as a non-profit institution, the Marrakech Museum of Moroccan Photography prides itself on being dedicated to exhibiting the best of Moroccan, North African and international0lens-based contemporary arts.